Organization Bio: Canada's leading innovative, career-focused educational institution. 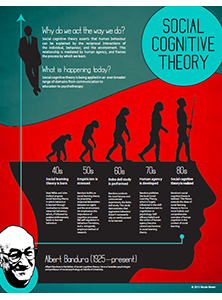 Summary: I wrote copy for and designed an educational poster to communicate the key aspects of the psycho-social theory called Social Cognitive Theory in a visually appealing format. Target Audience: Incoming Master of Professional Communication students and Professional Communication undergraduate students. Business Objective: To showcase the caliber of work produced and the type of projects undertaken in the Master of Professional Communication program.